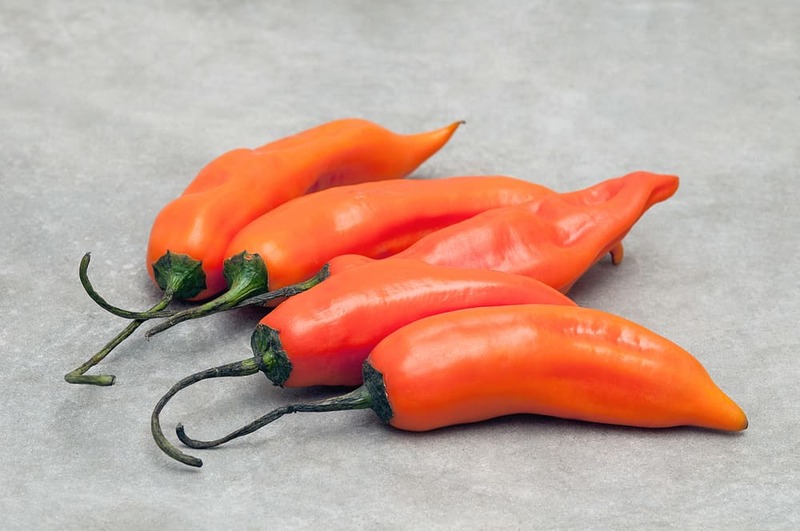 The aji amarillo is a member of capsicum baccatum family and is grown throughout Peru. The literal translation of aji amarillo in spanish is yellow pepper. But that can be a little deceiving. The color of the aji amarillo in it’s unripened state is in fact yellow. However, after ripening aji amarillo’s color turns to a bright orange. The aji amarillo seeds are what gives the peruvian pepper it’s kick. As a result, it is 30,000 to 50,000 on the Scoville Heat unit scale. Therefore, those who do not like spicy foods, deseeding the aji amarillo may be the way to go. It will definitely take off some of it’s edge. If you ask any chef the one must have ingredient in Peruvian cuisine, they’ll tell you aji amarillo, hands down. The Peruvian yellow pepper is the all star ingredient in many of the country’s national dishes. It’s used in an assortment of traditional Peruvian recipes. It takes various forms; as aji amarillo paste, aji amarillo sauce and whole aji amarillo just to name a few. It’s slightly fruity flavor is a hit with even the most discerning taste buds. But aji amarillo can be hard to find in the United States. If your local grocery store doesn’t carry them in it’s produce, frozen food or spice section you can buy them online at a Peruvian grocery store. Or if you live in a warm enough area, you can certainly try growing them yourself. These Peruvian peppers need approximately the same growing conditions as other chilis. Simply, place them in planters and make sure they get a lot of sun. They will grow to be about 4 to 6 feet tall and each plant produces about 35 to 45 peppers. They do take about 4 months to fully mature, therefor, you’ll need to be patient. Once they are ready you can use fresh or dry them. A few of the more famous Peruvian recipes that use aji amarillo as one of their main ingredients are Papas a La Huancaina, Aji de Gallina and Ceviche de Pescado. Aji amarillo paste is also used as a dipping sauce. The multiple ways aji amarillo is utilized in the kitchen truly makes this Peruvian food, Peru’s perfect pepper.